A pergola is a series of pillars supporting cross beams upon which a sturdy lattice is constructed. They can be a simple four column structure or a series of columns that form a passageway between buildings or gardens. They are usually planted with vines that grow up and over the lattice. They should be built from sturdy and long lasting materials because once they have been up for a few years and are covered with vines, repairs can be difficult. Pressure treated lumber, cedar and vinyl are some popular materials for construction of these simple, but elegant structures. 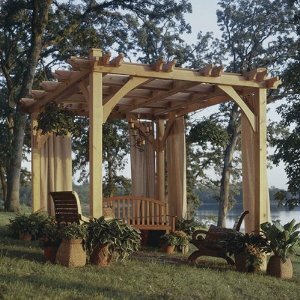 Here are some Downloadable Woodworking Plans for a pergola that can easily be altered to fit your garden.